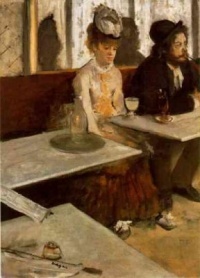 L'Absinthe (English: The Absinthe Drinker or Glass of Absinthe) is a painting by Edgar Degas. Some original title translations are A sketch of a French Café, then Figures at Café, the title was finally changed in 1893 to L'Absinthe (the name the piece is known by today). It is now in the permanent collection of the Musée d'Orsay in Paris. Painted in 1875–1876, the picture depicts two figures, a woman and man, who sit at the center and right of this painting, respectively. The man, wearing a hat, looks to the right, off the canvas, while the woman, dressed formally and also wearing a hat, stares vacantly downward. A glass filled with the eponymous greenish liquid sits before her. The painting is a representation of the increasing social isolation in Paris during its stage of rapid growth. The woman in the painting is Ellen Andrée, actress, and the man is Marcellin Desboutin, a painter, printmaker and bohemian. The café where they are taking their refreshment is the Café de la Nouvelle-Athènes in Paris. In its first showing in 1876, the picture was panned by critics, who called it ugly and disgusting. It was put into storage until an 1892 exhibit where it was booed off the easel. It was shown again in England in 1893 (this time entitled L'Absinthe), where it sparked controversy. The persons represented in the painting were considered by English critics to be shockingly degraded and uncouth. Many regarded the painting as a blow to morality; this was the general view of such Victorians as Sir William Blake Richmond and Walter Crane when shown this painting in London. The reaction is an instance of the deep suspicion with which Victorian England had regarded art in France since the early days of the Barbizon School and the need to find a morally uplifting lesson in works of art that was typical of the age. Many English critics viewed it as a warning lesson against absinthe and the French in general. George Moore described the woman in the painting: "What a whore!" He added, "the tale is not a pleasant one, but it is a lesson". However, in Modern Painting he regretted assigning a moral lesson to the painting, claiming that "the picture is merely a work of art, and has nothing to do with drink or sociology." Unless indicated otherwise, the text in this article is either based on Wikipedia article "L'Absinthe" or another language Wikipedia page thereof used under the terms of the GNU Free Documentation License; or on original research by Jahsonic and friends. See Art and Popular Culture's copyright notice. This page was last modified 20:54, 26 October 2015.